Going along the same vein of “radio kits”, this one is a little bit different. 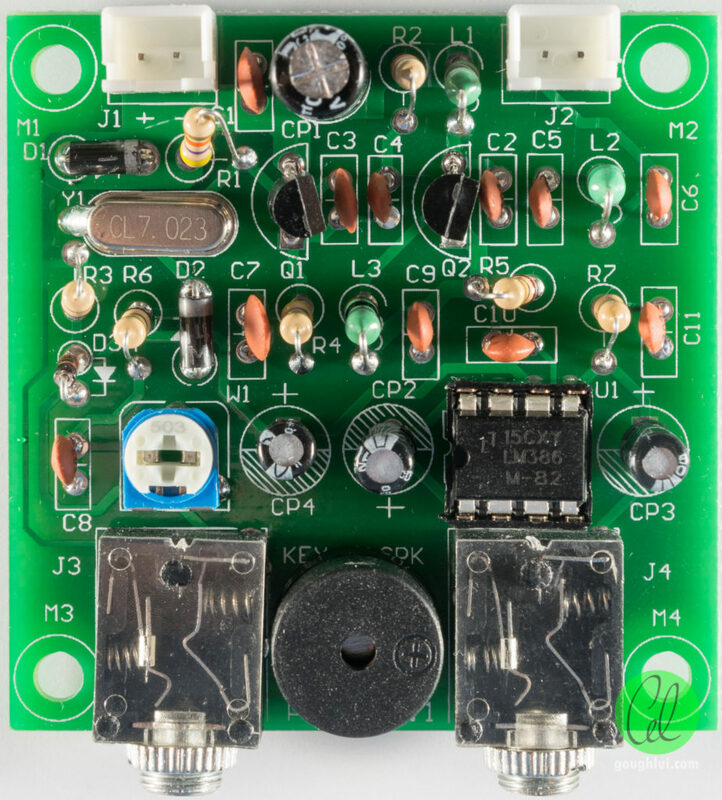 This one is a do-it-yourself PIXIE 7.023Mhz QRP transciever intended for amateur (ham) radio morse code (CW) usage. It doesn’t have many specs, but apparently is a popular seller with a few slight variations available on the market. While I do realize that a foundation callsign holder like myself isn’t allowed to operate “homebrew” equipment, a bigger issue is that I don’t know morse code proficiently either! I suppose that’s not a big issue for me, as I don’t intend to operate the unit “on air” as such, instead, I just wanted to build it and see it work. After all, costing just AU$4.69 including postage, it is an insanely cheap transceiver, even if it is basic and fixed-frequency. I suppose there’s nothing wrong with building one and testing it with a dummy load … it’s low power and I’m not really ready to go on air with it anyway. As with most kits, the adventure starts with a bag of parts. In this case, it’s a sealed anti-static bag with some paper inside, which is a good start. 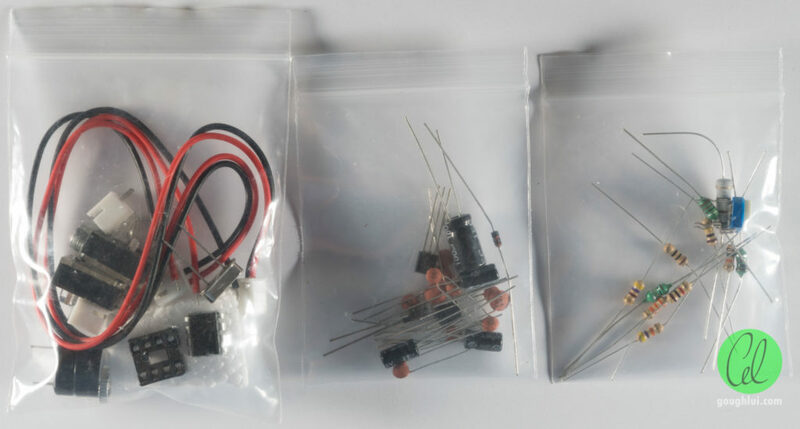 Unlike some of the other kits, the components in this kit are packed with care into individual zip-lock bags. 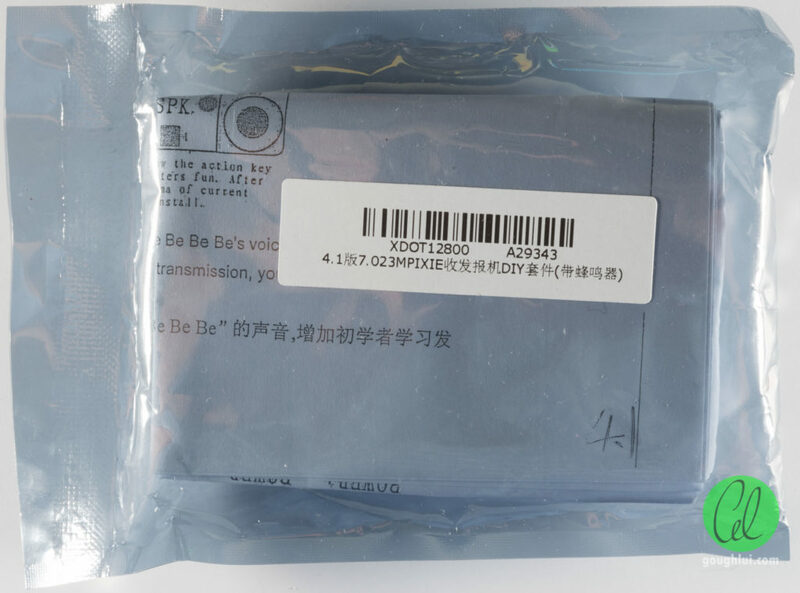 One bag contains all the resistors and inductors, another all the capacitors, diodes and transistors, and the last, the IC, crystal and hardware components. It’s nice to see that the DIP IC is packaged with an accompanying IC-socket making it good for beginners who might otherwise overheat the chip, and the socket and IC are both poked into foam to save the legs from being irretrievably damaged in transit. 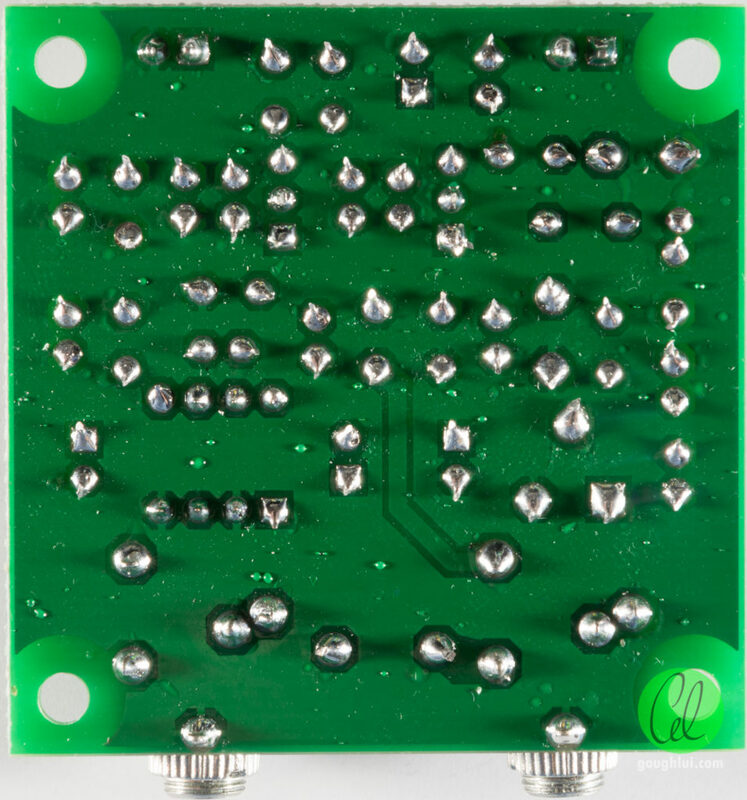 The components are mounted onto a roughly square shaped PCB with tinned pads, silkscreening and solder resist. The silkscreen is quite descriptive, especially when it comes to component orientation, although component values are not missing. 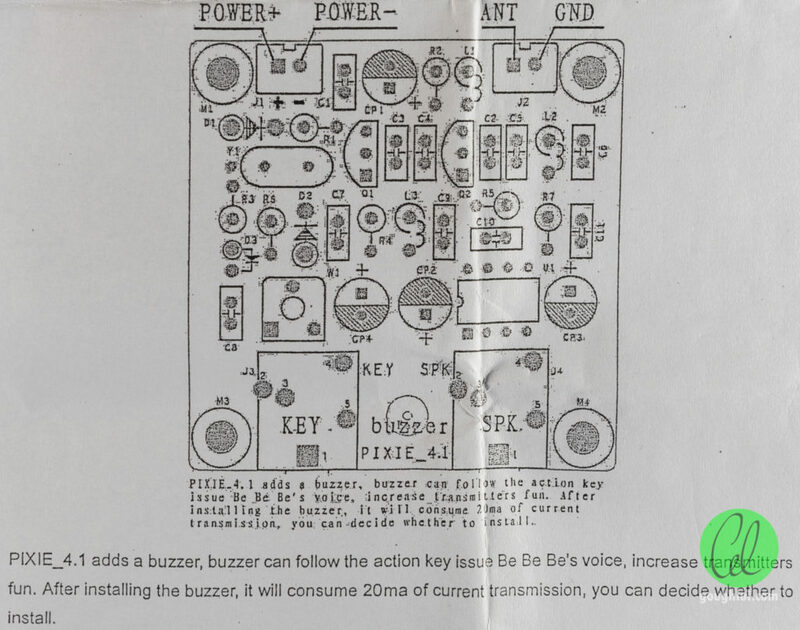 The beeper/buzzer being notated as “bee” sounds a bit funny. This is just one of several different variations on the concept – I’ve seen versions with BNC footprints for output and with/without buzzer. The PCB did receive some scuffing in transit, but that only affected the solder resist slightly. The PCB is double sided, with only really one trace on the underside, and mostly ground plane. 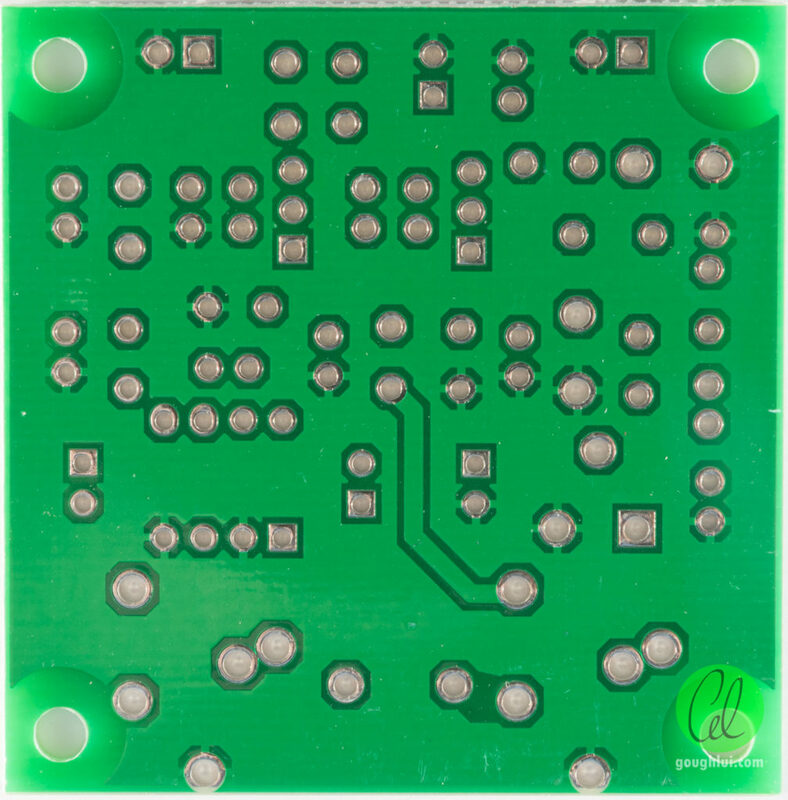 The pads are optimized for hand soldering with the grounded pads being thermally isolated from the rest of the plane with the “cross shape” pattern so to avoid sinking too much heat. It looks like a reasonable quality board as well. 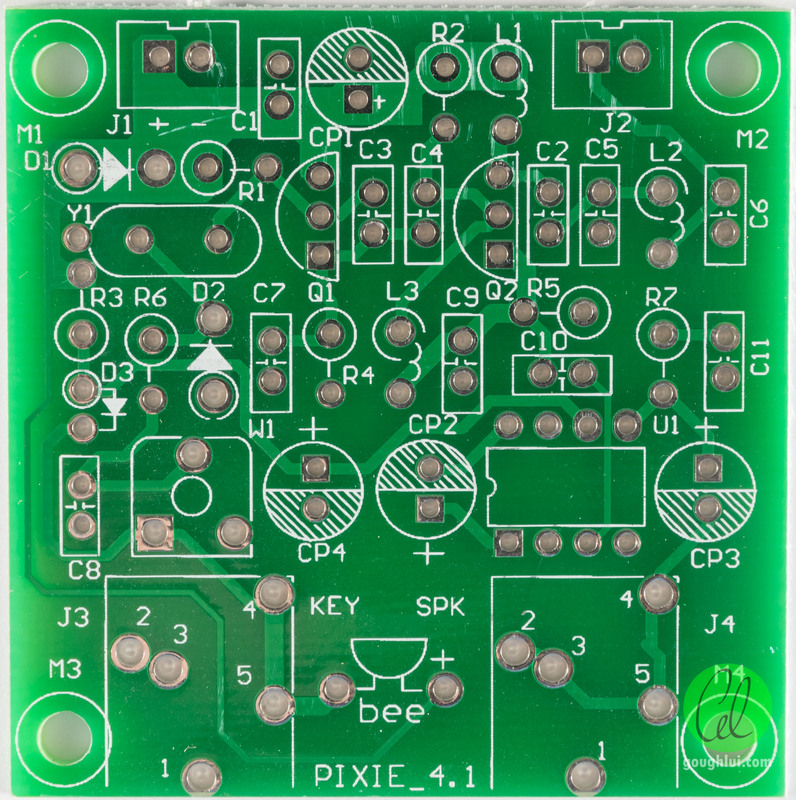 The PIXIE_4.1 adds a buzzer which sounds when the key is depressed, improving the functionality of the kit. Installing the buzzer is optional, although if fitted, it will consume an additional 20mA from the supply. The second page is the schematic for the unit – it’s good because that means I don’t really have to do any tracing to work it out. Because of the lack of explanation, its educational value is somewhat less than the Fun Way kits I grew up with. Taking a quick look, it seems that the unit relies on a 7.023Mhz crystal as a timing reference, forming an oscillator with Q1. R1 appears to be a biasing resistor, and D2 might be used to sustain the oscillation as a freewheel diode. The loading on the crystal seems to be adjusted by W1, allowing for the frequency to be “pulled” through a very limited range. 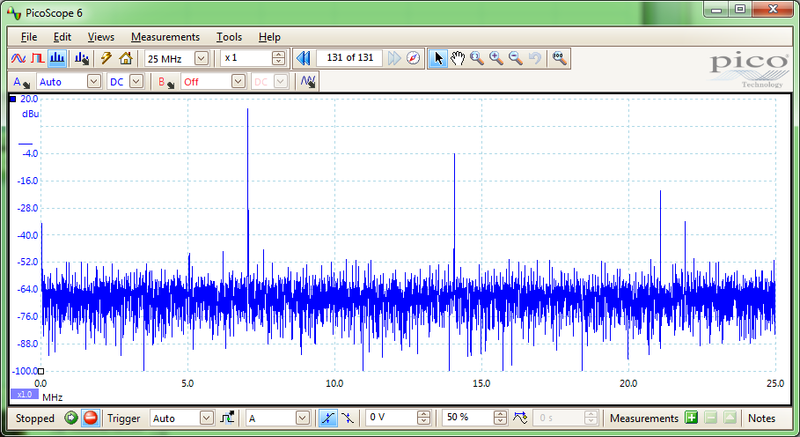 Q2 appears to be used to amplify the oscillation and drive the antenna, with R2 as its biasing resistor. When the key is depressed, it shunts out R5 which unleashes the full transmit power and also shunts out the receive path audio to the amplifier. When the key is not pressed, it seems that the transmit power is reduced significantly due to R5, but an oscillation still is driven so that the receive side detector can use it as a beat frequency. The antenna circuit has C5, L3 and C6 forming a pi-filter, which seems to have about 7.34Mhz cut-off and 46.127 ohm impedance. On the receive side, it seems D3 is used as a detector, with the antenna signal being driven into the main power rail, and this is DC blocked by C10 before going into the LM386 which is merely used as an audio amplifier. CP2 is used to bypass the power at the amplifier, with CP3 being used to DC-block the output to the headphones. From the crudeness of the circuit, it seems that we can’t expect too much in the way of performance, however, for the under AU$5 it costs, it seems quite an interesting way to do things. The IC really is only an opamp amplifier to drive a speaker/headphones, otherwise it’s good old “analog” electronics. The output quality will highly depend on the crystal and the way it’s driven, and also the filtering. When it came to constructing this kit, there were quite a few merits. This included the logical separation of components into type (roughly corresponding to mounting order), the PCB design having hand-soldering optimized pad shapes and sizes, a handy silkscreen layer, a manageable number of components, the inclusion of sockets/plugs and the use of only through-hole mounting parts. To build the kit only takes about an hour, or a little longer if you get distracted. As usual with most kits, you have to BYO solder, soldering iron and side-cutters. You might also have to BYO desoldering equipment if you make a mistake. As with other double-sided boards with plated-through hole vias, there’s no need to flow solder completely through to the pad on the other side. However, it seems that the holes on this board are slightly on the large side for easier component threading, so the solder flows through regardless. This can make it a challenge to achieve good looking joints as the solder may “bubble through” with residual heat as it is cooling. I had a lot of clear flux splatter residue on the bottom, but the pads soldered very easily. The pad Y1 next to the crystal wasn’t clearly indicated, but I suspect it is for grounding the crystal can, so a lot of heat is required to heat the can sufficiently for the solder to take. Whether this is a critical step is uncertain, but I did it anyway. It was good that the kit even had a 51 ohm 1W resistor as a dummy load included in the bundle. Some of the downsides of the kit included its mostly-vertical-component-orientation which is less easy to handle and prone to damage when handled without casing (as no casing is supplied). This does have the positive result that the transceiver itself is made physically smaller as a result. The silkscreen for the JST connectors seem to have the notch placed on the wrong side, thus if using the included leads, the colour coding would be incorrect. Constructors should check the orientation based on the wires and colour coding as supplied. This version doesn’t use a BNC connector for the output which might not be optimal for impedance mismatch issues in the case a match to 50 ohm coaxial is desired. No 3.5mm plug is included, or morse key, so you will have to improvise. In my case, I had some spare from another project, and I substituted a momentary push button for the morse key. You will have to supply your own power supply or battery connector (e.g. 9V battery snap). One thing I realized in the end was that the schematic did not have the buzzer/beeper drawn in, so the circuit likely reflects an earlier revision of the board. After a quick trace, it was determined that the buzzer is an “integrated” unit that beeps when voltage is applied, so it simply has the + terminal connected to Vcc, and the negative terminal connected to the key sensing line which is grounded when the key is depressed, thus completing the circuit and resulting in the very loud beep tone. In fact, the tone is so loud that I suspect many users will prefer not to have it. Just having one beeping away in a house is enough to wake everyone up. 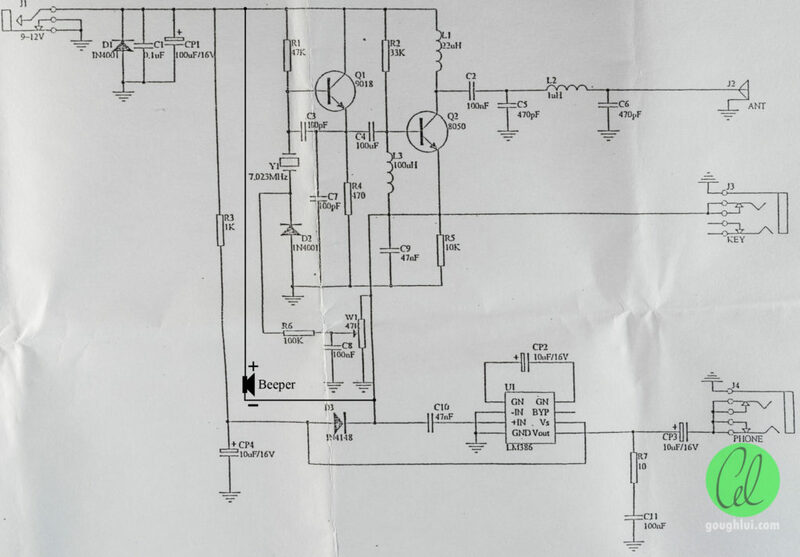 The unit is specified for 9-12V operation according to the schematic, but I found that oscillation was stable and emission existed at voltages as low as 2V. This makes it possible to operate this unit on 9V cells. The current consumption, and thus output transmission power, varies significantly as a function of input voltage. This seems well within the range of alkaline 9V cells, although as the cell voltage drops, the transmit power will drop accordingly. The transmission power wasn’t specified in the listing or the supplied sheets. However, I decided to test it by first measuring the included load resistor (50.2743 ohms) and then measuring the RMS voltage across the resistor when keyed/unkeyed at different voltages to determine the output power. I used my Picoscope 2205A with a probe set to x10 attenuation to ensure frequency response and to avoid potentially damaging my Tektronix RSA306 as I don’t have a power divider at present. This does come with the caveat that it also includes transmission power at unwanted frequencies as well, although it does give you a good idea of the total emitted power. 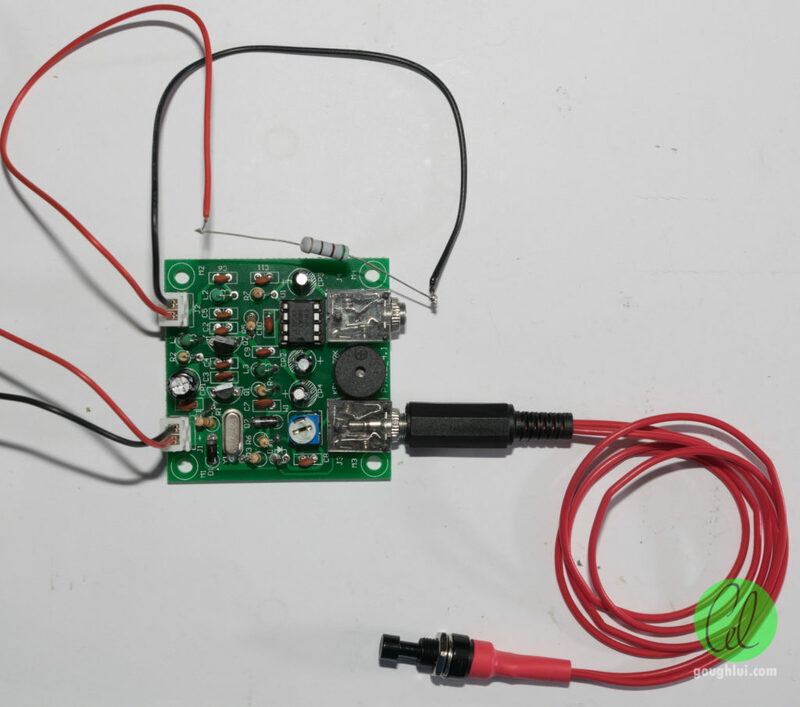 With the transmitter un-keyed, the unit does have a small amount of transmission going to the antenna, which is undesirable leakage but is a consequence of the design and permitting for a simple diode detector receiver. The amplitude consisted of an output power of 0.423mW. With this amount of leakage, I suspect it might swamp out local receivers looking for very weak signals. With the transmitter keyed at 9v, the output was about 317mW. Not bad especially considering the price. The probe was compensation-adjusted with the oscilloscope, so the non-sinusoidal shape is likely an artifact of the circuit’s ability to filter and shape the crystal’s oscillation. At 12v, the shape is still somewhat non-sinusoidal, however, the output power reaches 547.6mW making it just over half a watt. This is pretty impressive for less than AU$5. If you’re a little greedy, like I am, you might see just how far you can push it. I dialled up the voltage little-by-little waiting to see something like bad transmission purity or a transient runaway condition happen and then back-off. Sadly, the unit silently lost a lot of transmit power as the voltage was increased to 17v which was the absolute maximum it can handle. The oscillation still persists, but the gain is much less. This makes me suspect I might have partially destroyed Q1 (9018) which has a maximum collector-emitter voltage of 15v. Other than that, damage may have also occurred to Q2 (8050) or to the crystal through over-amplitude driving (although I doubt it, as I didn’t see any spectral indications of this). Also of note is that the LM386 is also rated for an absolute maximum voltage of 15v, so I suspect it’s probably just best never to exceed or even get to 15v. But even before I killed it, I did test its spectral output which gave some good reasons why you might not want to use this kit on the air. Looking at the spectral content, we can see harmonic content that is not being too well suppressed. The fundamental is 7.023Mhz, but there is also emission at 14.046Mhz and 21.069Mhz. There is also a spur of non-harmonic distortion in the 22-23Mhz region it seems which might be an intermodulation product or due to the quality of the crystal itself (an overtone?). The pattern suggests to me that the drive to the crystal may be quite high. 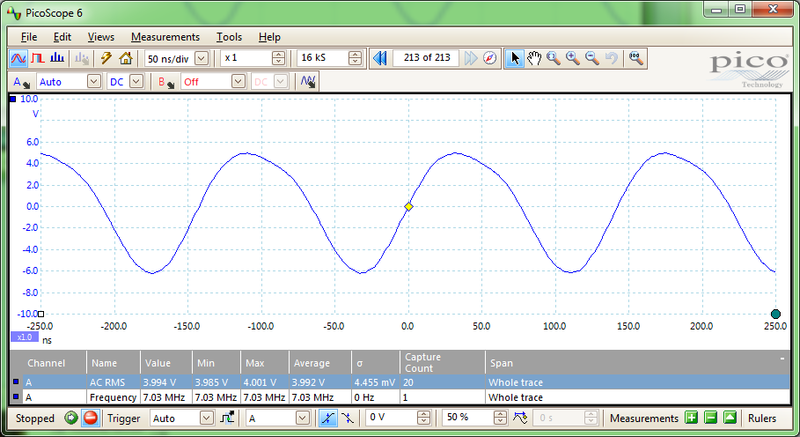 There may be further significant emissions at higher frequencies, but the Picoscope I have only has a 25Mhz bandwidth. 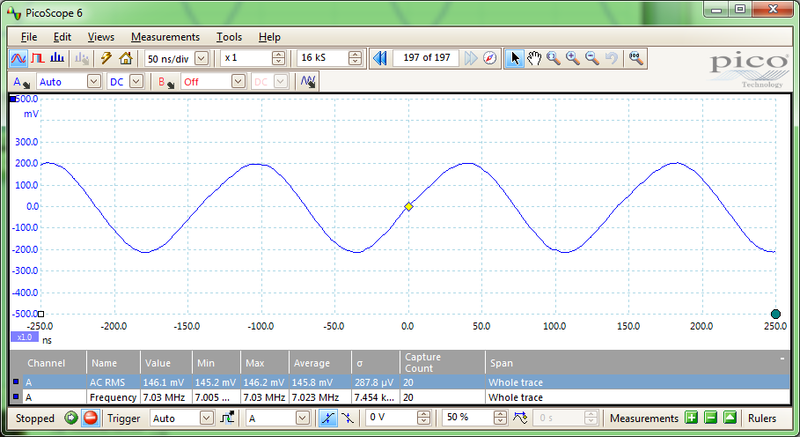 The 14.046Mhz output lies in the 20m ham band, although the 21.069Mhz lies outside the 15m band. The power is about 20dB below the fundamental on 14.046Mhz (about 5mW), and about 36dB below (about 0.13mW) the fundamental on 21.069Mhz, so it’s really not going to be that much in terms of absolute transmit power but it might cause annoyance to weak signal DXers and might still propagate far under ideal conditions. Because transmitting into the dummy load resulted in enough leakage into my receiver on the same computer, I decided to listen to the transmission. It had a rough note, and on the spectrogram, we can see that the energy is spread over a number of frequencies instead of being one pure tone. This is not a desirable characteristic, especially if operating in crowded bands, as your fellow “neighbours” won’t appreciate being transmitted over, and the recipient probably can’t make use of all the transmit power if they have a very narrow filter. At least the keying on and off did not result in any strong keying clicks, so that was a positive. In between keying, we can see the local oscillator leakage show up – the frequency appears to drift somewhat in-between transmit and receive possibly due to the crystal drive amplitude changing dramatically resulting in the frequency shifting. This is another limitation of the kit, and might make it difficult to manage with multiple QSOs on the air at the same time. In my experience, the receive path didn’t seem to be too interesting. One downside was the loud popping on keying/unkeying that seems to be due to the design, and a lack of volume control. Unfortunately, the characteristics of the reception path wasn’t quantified as I didn’t have anything that could transmit in that frequency to test it with. The frequency is pretty quiet where I am, at least, when I’m looking and QRP operation isn’t as popular here as it might be in China where 7.023Mhz is apparently a hotbed of activity. That being said, it doesn’t look like there’s much in the way of filtering in the receive chain, so it’s quite possible that picking out a single CW transmission in a sea of many will rely on your “mental” frequency filter and the limited amount of frequency pulling on offer with the potentiometer. This was the first radio kit I have built that was a transciever. As a kit, it was inexpensive, complete, easy to construct with all through-hole components with good PCB design and straightforward. The educational value is somewhat limited because of a lack of explanation of the circuit, and the schematic was not perfectly complete. It has an attractive compact footprint, requiring most components be vertically installed, and was a pleasure to construct. To actually use it, you need to provide your own antenna, power supply, morse key, 3.5mm connector and headphones. It also has a very loud buzzer which I’d recommend not fitting entirely. While idle, the unit puts out enough oscillator leakage that it can be detected by adjacent receivers and block the signal you might be trying to copy. While transmitting, the signal is rough in tone and relatively “wide” as a result. It also has harmonic and non-harmonic emissions although the power levels may not be too concerning. Receive sensitivity is probably quite limited. However, despite that, it is a very good offering for AU$4.69 offering about half-a-watt of output in the case of 12V supply. It will keep you entertained for an hour at the least, although to legally use it on the air requires an amateur radio license of standard-or-higher level. It is probably amenable to a cheap adaptation to a beacon transmitter, but being “fixed” in its frequency due to its crystal may make it transmit in an overly-crowded frequency. It should operate off another crystal of a similar frequency, although sadly, such crystals within the amateur band are rather limited (e.g. 7.15909Mhz, 7.2Mhz). Maybe I should get another seeing as I destroyed this one in my greed for more output power … but I have a feeling it probably won’t be greatly useful to me. It was only when I finished building the kit and testing it that I found out that my amateur license had indeed lapsed as of 20th March this year. I remember anticipating the renewal letter in the post, but it never arrived. Maybe it was stolen or lost in the post. I normally pay my renewal every year on a “religious” basis as my contribution to ACMA and my hope that the amateur spectrum would remain open for the enjoyment of fellow hams. Even to this day, since I’ve received my callsign in 2011, I’ve not once had a QSO on the air! It seems that the guys around me typically just like chatting to themselves over the local repeaters – and I’m fine with that. I’m not a chatty person myself. I just prefer listening in most of the time, but maintaining the license is more of a way of saying “amateur radio is not dead” and to help keep them from selling away spectrum that we could use. I’ve contacted ACMA directly to see if I can retain my callsign and renew my license right away – after all, it’s an administrative thing that completely slipped my mind and is what happens when you get too busy to keep up with all your hobbies. Maybe if I have more time, I could consider taking the exam to upgrade to Advanced – at the time I was applying for the license, I settled for Foundation mainly because it was cheaper and could be achieved with certainty in the one day, however, I did study for the Advanced level and I might have been able to pass … I just didn’t want to risk it, especially with the license sponsored by BlueSAT/UNSW. 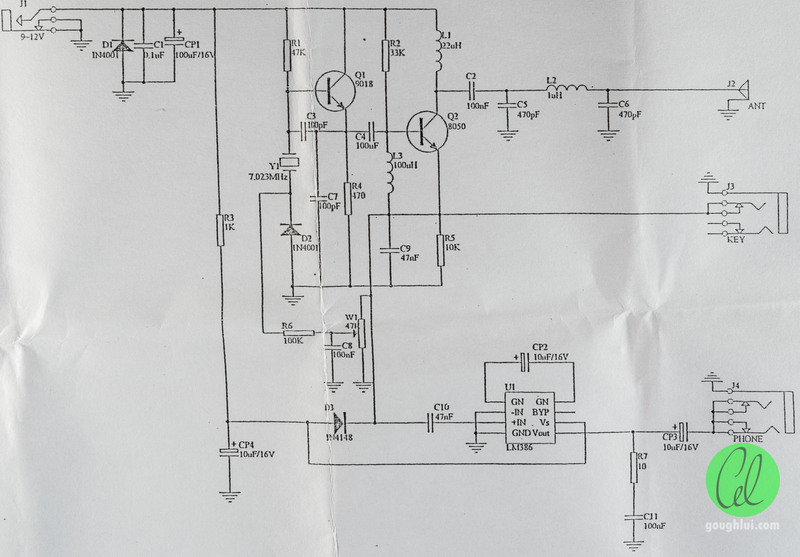 This entry was posted in Electronics, Radio and tagged ebay, electronics, made-in-china, project, radio, rf, schematic. Bookmark the permalink. D2 (1N4001) as Variable Capacitor (Varactor) provide probably about 10~30 pF range in this circuit depending on reverse voltage controlled by W1. I was unclear what a “Foundation License” was until I looked it up, rather like our (USA) very old “conditional license class” way back in the 1960s-1970s. Even our Novice classed (no longer issued) has some HF privileges. I believe our current Tech (now our lowest license class) has HF privs as well. I think the point is for such licensees to obtain the next license up to be able to operate on the bands…. Did I pretty much get the understanding of that license correct? Very GOOD article, thank you very much for putting it out. In Australia, we have three amateur radio license levels – Foundation, Standard and Advanced in order of privileges. The Foundation level was a rather “new” introduction which was made to try and revive amateur radio interest which had been declining for many years by offering a license that could allow you access to basic analog FM voice on VHF/UHF bands using commercially made transcievers. This was meant as an “introduction” in a way, but was also the best way to take your exams, as our licensing is based on a theory and a practical exam (i.e. two exams). The Foundation exam includes theory and practical components and is the same price as just the practical exam for Standard and Advanced levels. As a result, it makes sense to take the Foundation exam, as the practical component is the same for all three levels – if you pass for Foundation, you don’t need to do the practical again *and* you can do some basic non-digital operation in the meantime. I was intending to get my Advanced level license at the time, and I had actually studied for the exam, but the group I was with were not really well prepared so we decided to just get the Foundation and upgrade later. Unfortunately, between then and now, I’ve been too busy to operate, or listen much … instead, I maintain my foundation call and pay my licensing to support Amateur Radio spectrum for the other users in the hope that it’s still around when I have the time :).